Snap/YouTubeSnap CEO Evan Spiegel says he has a shyness problem. 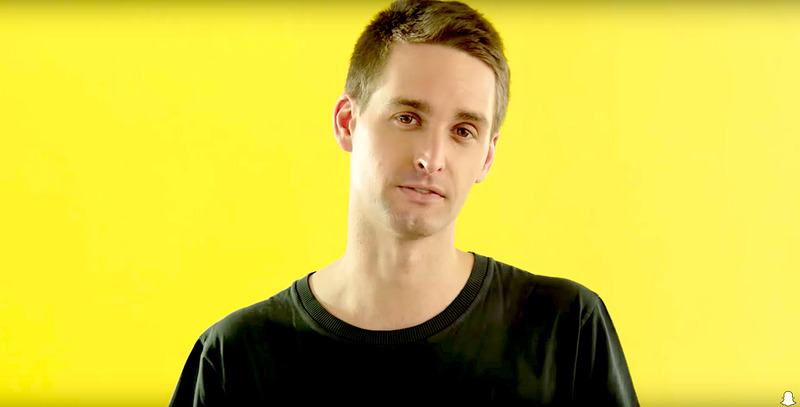 Until recently, Snap CEO Evan Spiegel never presided over companywide meetings, and he rarely interacted with employees, according to a new Bloomberg report. Spiegel said he’s shy and his religious upbringing taught him to avoid the spotlight. But in response to criticism, he’s been trying to interact more with employees and managers. Evan Spiegel is a billionaire thanks to the app he co-created, Snapchat, which is used by millions of people around the world. He is married to Miranda Kerr, a supermodel who is a celebrity in her own right. But until recently, he was reluctant to be the center of attention among his own employees, according to a new profile of Spiegel published Wednesday by Bloomberg. Spiegel never presided over companywide meetings, because Snap didn’t hold any. And, until recently, Spiegel would rarely roam the campus and talk with workers, according to the report. “I remember thinking, Why would I go around the company and just chat with people? Like that would be so awkward,” he said. Spiegel is shy, he told Bloomberg. And his religious Christian unbringing encouraged him to be modest and not seek attention for himself, he said. He is “uncomfortable or intimidated speaking to large groups,” he said. “I remember growing up I was taught to be small, be a turtle,” he continued. Spiegel’s reticence stands in contrast to the public nature of his life and company – and his outsized compensation. He made headlines when he married Kerr last year and when Kerr gave birth to their first child together earlier this year. But he’s also well known for running the company that makes Snapchat, the popular messaging app that has some 188 million daily users. He’s also drawn scrutiny for being the mostly highly compensated CEO in the US last year. After coming under criticism for his management style and his company’s poor performance since its initial public offering last year, Spiegel has been trying to be more outgoing and a better manager. He hired a management coach last year and anoymously surveyed employees about how he could improve as a leader, according to the report. He’s also started to interact more with workers. “Now I go walk around the office and get a ton of emails like, ‘Oh, my God, that was awesome you came by,'” he said. In December, for the first time ever, Spiegel held a meeting with senior managers to go over priorities, Bloomberg reported. And in March, the company started holding all-hands meetings. Apparently, though, Spiegel’s shyness still can get the best of him. At a staffwide meeting in July, he mostly let his fellow executives do the talking, Bloomberg reported.